Have you ever found yourself in a particular place and suddenly felt completely at home? Melisande Aquilina couldn’t identify this pervading feeling at first, but when she visited the University of Oxford in Oxfordshire, England, a couple of years ago, for some strange reason it felt amazingly familiar. She had never been there before and yet, that indecipherable feeling of connection could not be shaken off. The architecturally gothic buildings and the streets thronged with bustling students, the jovial camaraderie and the many fairy-like gardens and little shops sporting old tomes and coloured school uniforms... I just couldn’t put my finger on it. Until I started visiting specific places of interest that is, and then all the pieces of the puzzle magically made sense. Oxford is Hogwarts. It is Diagon Alley. It is Lyra’s parallel Oxford from Philip Pullman’s ‘His Dark Materials Trilogy’. It is Terry Pratchett’s ‘Unseen University’ on Discworld, J.R.R. Tolkien’s playing field, C.S Lewis’ inspiration, and Lewis Carroll’s domain. Traces of Wonderland and Narnia permeate the streets. Oxford - the place where so many literary titans met, conversed, evolved, were influenced, and created their master works. We left our car in a small parking area outside the city proper and took a bus which left us on Magdalen Street, where the first thing we saw was Balliol College. This is the oldest of the 38 constituent colleges which make up the University of Oxford. When one speaks of this University, one must keep in mind that the different colleges or communities in which students live and study all present different outlooks and approaches to learning, having their own various idiosyncrasies, sports teams, coloured uniforms, patron saints, facilities, and academic prospectus. And yet they all make up one University - 38 different parts of one great whole, as well as a number of academic departments divided into four divisions. Is this starting to sound a little bit familiar? 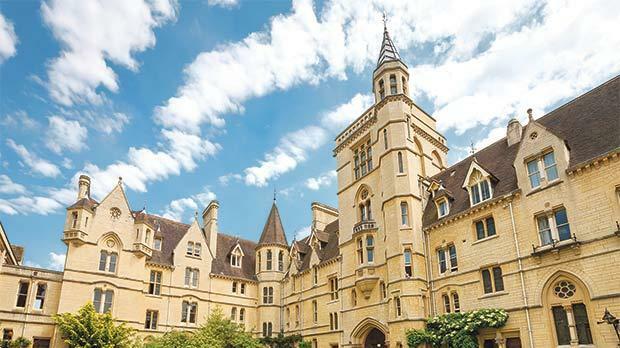 Balliol College, founded in the late 13th century, had long existed as a medieval hall of residence for students. 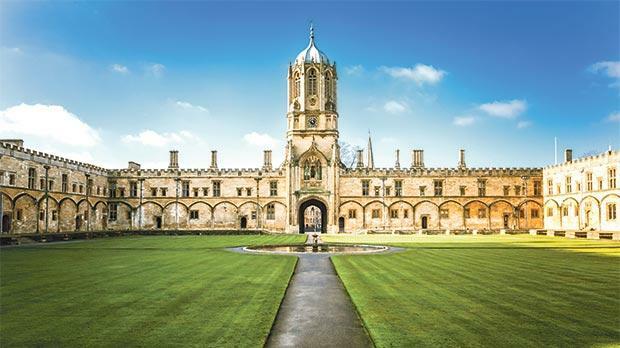 There is, in fact, evidence that teaching took place here as far back as 1096AD, making Oxford the oldest university in the English-speaking world. Moving on towards the iconic Bodleian Library, I passed outside the enchanting Sheldonian Theatre, built in the 17th century. Its eight-sided cupola is truly a sight to behold. However, I had no time to enjoy any of the music concerts or lectures taking place within. As we walked away from the theatre, I chanced to look up and for a moment, thought I had been suddenly transported to Venice. This is because I was passing under Hertford Bridge, also known as ‘the Bridge of Sighs’, which joins the two sides of Hertford College. Although popular for supposedly being a replica of the eponymous Venetian Bridge, it actually looks more like the Rialto Bridge of the same city. My target, however, was the second largest library in Britain - the Bodleian Library, which is famous for containing each and every book published within the UK. Over 11 million volumes housed on 120 miles of shelving to be precise. Are you impressed yet? I was all agog even before going inside. When I stepped over the threshold, I was flabbergasted – it was Hogwarts! Literally. The Bodleian Library was used as part of the set through-out four of the Harry Potter movies, not just as a library, but as the infirmary, as well as serving as the Hall where Professor McGonnagal teaches the students to dance in Harry Potter and the Goblet of Fire. Duke Humphrey’s Library, which is the name of the oldest reading room within the Bodleian, was used for the scene where Harry Potter enters the Restricted library under his invisibility cloak with a lamp to steal a book in Harry Potter and the Philosopher’s Stone. Here, one can also find a section of mysteriously chained books, which are known to have inspired Terry Pratchett’s depiction of the magical library within his ‘Unseen University’ of wizards. And what about the magnificently vaulting ceiling within the interior of the Divinity School, a medieval building which is attached to the library itself? Definitely not to be missed. Just a side-note… the official head of Oxford University is called the chancellor, while the vice-chancellor is the one who organises central administration and the in-house professors are generally called ‘Masters’. Readers of Terry Pratchett should find themselves familiar with this state of affairs. The coat-of-arms of Oxford University, an open book with a crown underneath it and two above it, funnily looks a lot like the coat of arms of the Unseen University too. Moving on down Catte Street, I soon visited other well-known Oxford Colleges, such as All Souls, Queens, as well as Magdalen College, where C.S Lewis, author of the famous Narnia books, was a tutor, and Exeter College, where I could admire the bust of one of its most famous past students, J. R. R. Tolkien. On the other hand, unfortunately I did not have the time to visit the cloisters found at New College, which were used as the backdrop for certain scenes of Harry Potter and the Goblet of Fire. Needing a break and something to eat after all this walking and awe-inspiring sightseeing, I paused at the Oxford Covered Market, centred in the middle of the city. This historic market goes back to the 18th century. It offers a plethora of fresh food stands, artisans’ products, traditional stalls, greengrocers, bakeries and handcrafted knick knacks. Truly a landmark in its own right. After some well-merited refreshments, we walked on down Wheatsheaf Yard towards Christchurch Cathedral, which serves as both the College Chapel and Mother Church for the Diocese of Oxford. The gothic long-spired building, with its colourful stained glass windows, vaulted cloisters and intricately carved ceiling, is truly one of a kind. A short walk south of the cathedral brought us finally to Christ Church College, which, for me personally, was the climax of my trip to Oxford University. I definitely know which college I’d wish to attend if I could be an alumna of Oxford University! ‘Welcome to Hogwarts’… so says Prof McGonagall as Harry is about to enter his school for the first time. And those same steps we see on screen are the same steps which actually lead up the dining hall at Christ Church College. The Meadow Building, built in the Venetian Gothic style popular during the Victorian period, dominates our view as soon as we enter this college. The courtyard also gives one a view of Bodley Tower, whose picturesque stone staircase was portrayed magnificently throughout various Harry Potter movies. Up the magical staircase we go to the dining hall at Christ Church College. The first thing we see on our immediate right as we enter the hall is a portrait of Charles Dodgson, better known as Lewis Carroll, famed author of Alice’s Adventures in Wonderland. The large stained glass windows around the hall and above the fireplace sport a myriad of Alice in Wonderland figures - from Alice herself to the white rabbit, and even the mock turtle. It was while Dodgson was rowing on a small boat near Magdalen College with the Dean’s three daughters, of which one was called Alice Liddell that he first started improvising the tale we all love and know so well. Christ Church Dining Hall was the inspiration for the Hall in Hogwarts, with its wood-panelled walls, its long long tables and its tiny lamps. The movie was not actually filmed in it, but a perfect replica of the place was reproduced within studio. The many portraits lining the dining hall in Christ Church also played an important part in J. K Rowling’s novels. The table at the far end, known as ‘the High Table’ and used by senior members of the college, was also perfectly replicated as the table where Professors at Hogwarts dine and make speeches. No trip to Oxford is complete without a visit to Christ Church College, just as no tourist worth his salt could drive off without spotting the small store known as The Alice in Wonderland Shop. Located just in front of Christ Church College, this colourful Wonderland emporium stands on the historic spot pre-viously filled by Alice Liddell’s favourite candy shop. The shop is full of Alice in Wonderland merchandise – different decks of cards depicting characters from the story, tiny china tea-sets, replica pocket watches, figurines, tea cosies, books and much more. If, like me, you’re an Alice aficionado, prepare your cheque book!